As 2017 begins, the threats to the United States from the Global Islamic Movement, aided by its hard-left/marxist allies, is greater than ever. 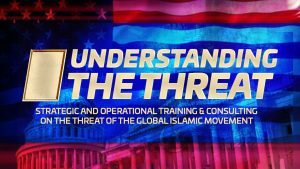 UTT is the only organization providing: law enforcement with specific ways to identify and locate jihadis (“terrorists”); analysts and intelligence professionals with a key understanding of how to assess the threat; and leaders with strategies to dismantle the networks at the state level. UTT speaks truth about the threat in a clear and concise manner unhindered by the noise of what some people wish the threat is. At UTT we know America cannot win a war if we fail to unhesitatingly call out the enemy for who it really is. We will not defeat the Global Islamic Movement and its allies by using “moderate” or “reformist” muslims, nor can we hope that “good hearted” Islamic scholars are going to move the global muslim community towards a more peaceful “version” of Islam. We must address the threat as our enemy states it and deal with it at that point. This is how we fight and win wars. Failure to do this will lead us to defeat, as was handed to us in Iraq and Afghanistan. Join UTT’s efforts to lead the ground-level assault on the enemies of our nation. We need your help! Bring the 3-Day UTT training program to your community. Share the successes and work of UTT with others. Financially support our efforts. Reach out to us and let us know how you might help us in other ways. You are needed. Join UTT as we put freedom back on the offensive where it belongs. Given the number of treasonous quislings and sharia-adherent Muslims with top U.S. government jobs who disingenuously claim that to name & defeat the invasion by jihadist barbarians the country is witnessing would equate to a 1st Amendment violation of the free exercise of a “religion” — unless the incoming administration embarks from day-one on a robust & relentless quest for contextually related federal indictments, UTT’s voice in the wilderness, and survival tactics with total annihilation in mind of “Phase-5’s grossly over confident lunatic members of a so called “Global Islamic Movement” – by whatever it takes – may be all we have left. E.g. think Tarawa & Guadalcanal fortified with mosques rather than caves! Furthermore, it is tragically paradoxical and utter madness that Special Agents of the one law-enforcement entity that every cop in the country is taught to respect, attempt to emulate, and thus rely on for guidance, the Federal Bureau of Investigation — “FBI” — thanks to their penultimate & current directors. are being denied access – NOT EVEN ALLOWED TO READ – 1600 pages of the very training & operational data which would enable them to focus on the inner-core of a criminal apparatus they’re mandated to investigate under American law, by virtue of content referencing any word, phrase, insinuation or comment pertaining to Islam. Too, regardless of how well intentioned PD trainees seem to be notwithstanding obvious contradictions taking place at least somewhere in the world every day, in view of the foregoing outrage, skepticism is bound to take root in the minds of many who naively cling to the belief that however the FBI approaches any question relating to crime must be the unassailable logarithm which they too should adopt; which flies in the face of what UTT is assiduously working to achieve (regardless of flowery canards such as the one pertaining to Columbus, Ohio, which in addition to running a close race with Minneapolis-St. Paul, Minnesota to assimilate non-vetted Muslims from terrorist States, has the only governor in the United States who still supports said type of arrivals, and publically said so at a relatively recent Governors conference in Florida).